From the Fridge to the Feed Room! – Our Panel of Fuzzy Judges Decide! FROM THE FRIDGE TO THE FEED ROOM! Our Panel of Fuzzy Judges Decide! I was milling about my refrigerator, hoping for inspiration in a brownie with sour cream frosting, when it hit me! 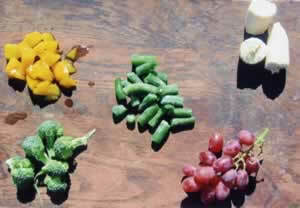 Today’s topic would be Healthy Kitchen Feed! My husband always tells me, “Honey, you may not like to cook but you love to feed!” Ahhh, truer words were never spoken. So, there in front of me, inside the crispers calling to me, were several bags of fresh fruits and veggies. Hmmmm, I wonder what the horses would eat besides the usual carrots, apples and raisins. I wonder if any of it is bad for them? Herein began the alternative horse foods (and clean out your refer while you’re at it) taste test potpourri. Green Beans, Lettuce, Peas, Celery, Plantain (not that you have that in your refer everyday), Sweet Potato Greens, Beet Greens, Parsnip, Turnip, Mango, Dates (pitted), Bananas with Peel, Citrus with Peels, Any Melon especially Watermelon with rind (fun to watch them eat this, too! ), Zucchini, any Squash, Bean Sprouts, Avocado, Guava, Grape, pitted Cherries, any fruit without their pits like Nectarine/Peach/Plum, Raspberries, Blackberries, Blueberries, Strawberries, Pears and Honey! (In the seeds category, sunflowers are good). So, after my taste testers gave me their full attention and best efforts, I can honestly say they are all different in their testing styles and all have different palates. Most everyone liked the lettuce but my Morgan mares just sniffed at it. 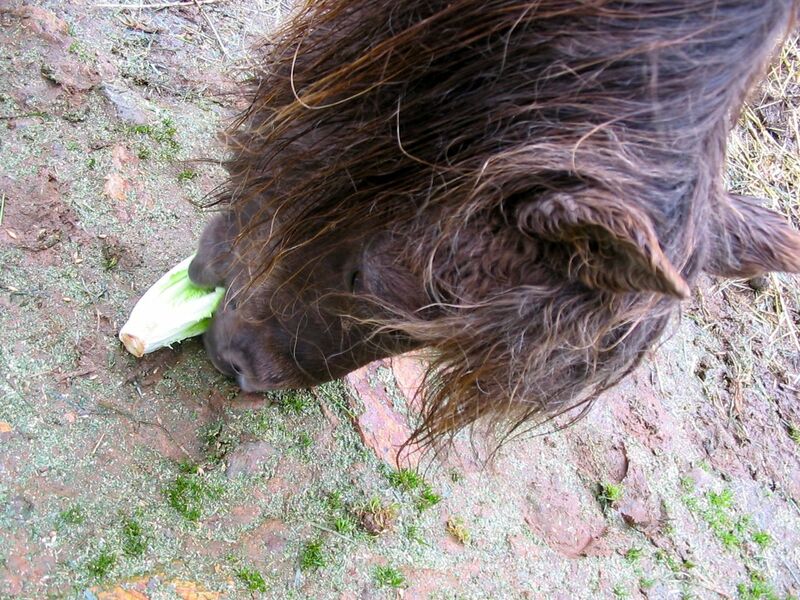 My Mustang was very dubious of anything new (as any good mustang would be) but she loved the bananas, which I’m sure she never tasted in the wild… One Shetland loved the lettuce and red peppers but hated everything else, whereas the other Shetland loved the oranges and bananas only. 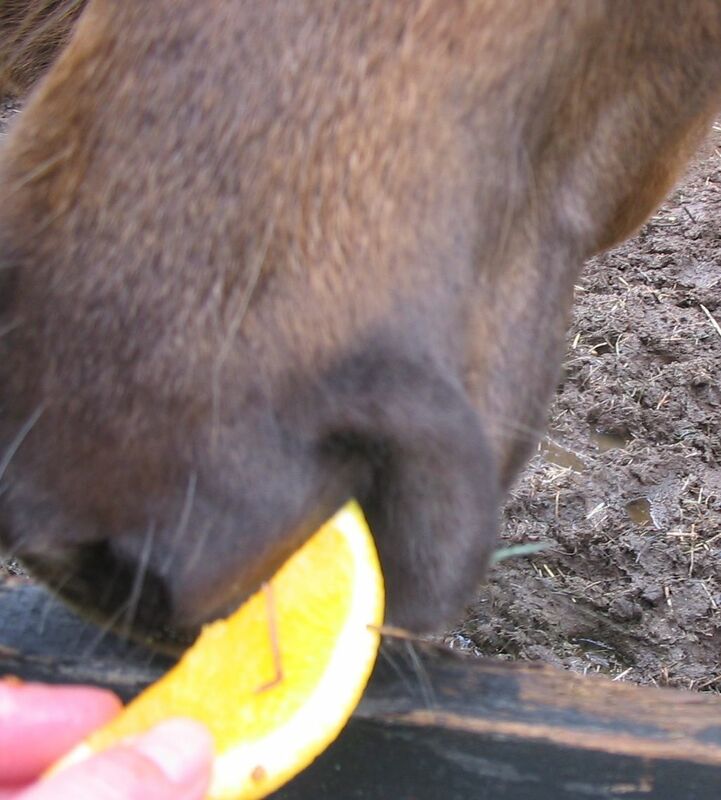 My donkey, Norma, ate the orange with such precision and relish that I gave her the grapefruit as well. Aladdin ate most of whatever I gave him except he dumped the bowl when all that was left was eggplant, zucchini and red peppers. The TWHs looooooved the lettuce and citrus but only nibbled on the zucchini. No one cared for the parsley but they all took an ittybitty bite – just to be polite. Ahh, but sadly, I come full circle now because there are eggplant and zucchini bits spit out all over the place. Too bad Fanny isn’t still with us… she would have a field day hoovering it all up. As an aside, there are several recipes for good horsey treats online. Here is one of the many websites for healthy treats. This one looked good. 2 cups rolled oats or Quaker Oats (original), ½-3/4 cup apple juice, 2 apples chopped into small pieces, ½ cup dried mango or guava, ½ cup shelled raw unsalted sunflower seeds, 2 tablespoons molasses, 1 cup bran (wheat or rice). Instructions:Mix everything together. Drop on ungreased baking pan by teaspoonful. Bake for 20 minutes at 375 degrees F. Give one at a time. YUMMY! A Hodgepodge of Updates: An Equion sale, Geoff Tucker the Natural Dentist and our July Bucket Funder, Spirit! We have Copra now here, too! It is also in Renew Gold. Lovely stuff! I live in Vanuatu ( look above New Zealand ) and our horses here will climb trees to eat papayas, theyare crazy about the fruit,the leaves and the tree itself, bananas makes their eyes crazy for more, we had one who charged one of our riders as she was bringing a banana bread ….We have no hay here so they eat green grass and copra , dried coconut meal after the oil has been pressed, tropical horses,tropical tastes. Please change this list to prevent someone poisoning their horse???? 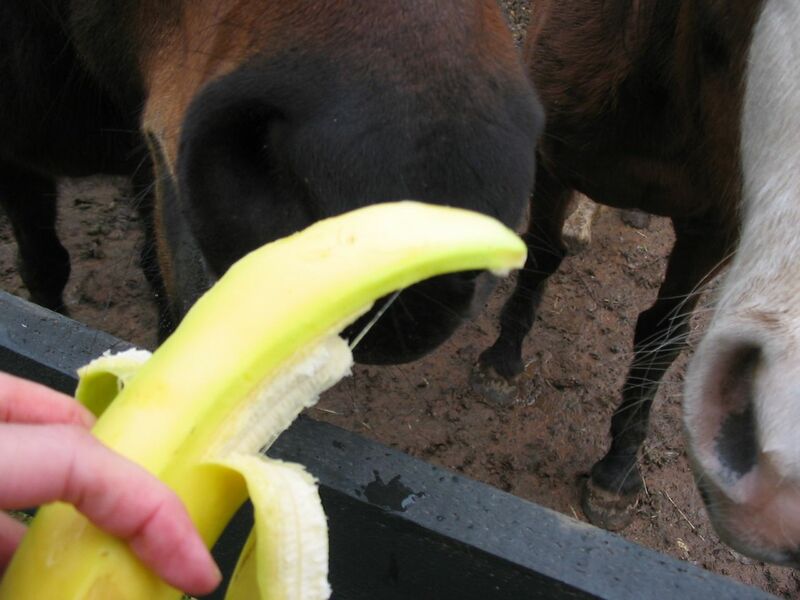 Just FYI, quarter horses should not be fed bananas because of the hypp disease/carriers of the disease. 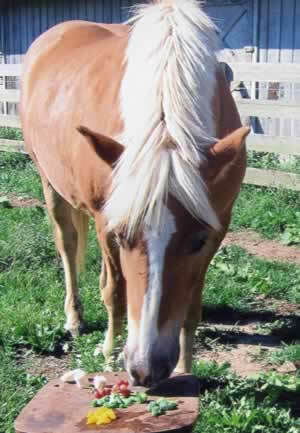 cabbagr has been used to treat ulcers in horses quite successfully. My horse loved corn on the cob. He would eat the wrapping and everything…couldn’t get enough! Seen sweet potatoes on several good list along with turnips and rutabegga, fed sweet potatoes to full size horse with no reaction. AVOCADO IS A NO-NO TO ANIMALS! I am curious if the reason why horses should not have broccoli, cauliflower, potatoes and susuch, is because they are sulfuric vegetables? My Tennessee Walker LOVES pears and carrots and I usually try to lean towards the apple treats from my local feed store because I know those he can eat and thank you for showing what not to be eaten. What kind of string or wire did you use for the Kabob? him to become overweight, Insulin Resistant or Founder. Be very, very careful. Thanks so much for sharing this! We recently got my daughter a mini horse. He loves apples but turns his nose up at carrots (apples and bread were the only treats he got previously). I was looking for some homemade horse treats and Pinterest lead me hear. I will definitely be testing some of these out for our boy. My parents have 5 apple trees he has been getting to try apples off of lately but don’t know why I didn’t even think of offering him pears off their pear tree! I wish you had put Mustard Greens on the Do Not Feed list, as people might incorrectly extrapolate from the Beet Greens and Sweet Potato Greens on the Good list — they are highly toxic to horses, and I know of a beloved and accomplished Welsh pony who recently died from eating them. They tried hard to save her but there is no antidote, and I think she suffered a lot before she died. 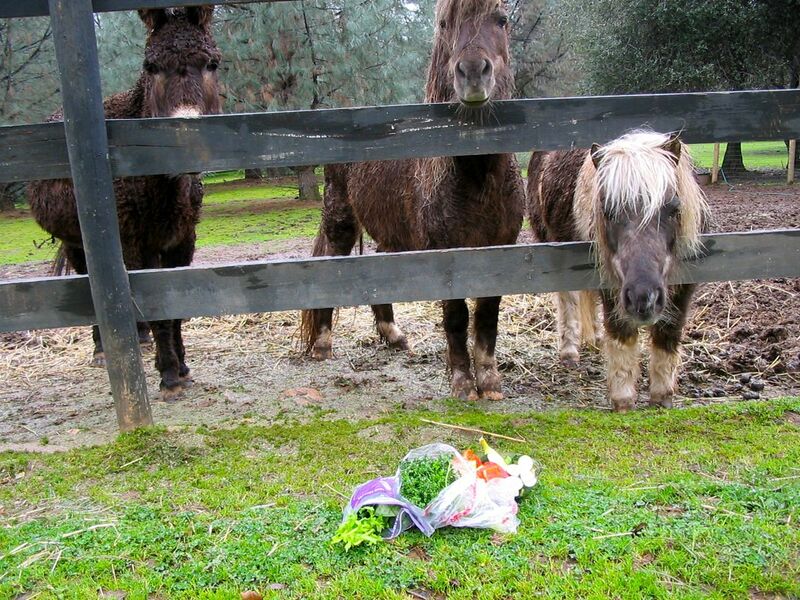 Sadly, they suspect someone may have tossed them into the paddock thinking they would be a treat. Hi there! Odd that you would be searching for music events and stumble upon my blog. glad you enjoyed it nonetheless. Thanks again for the comments. In the blog world, a comment is golden. Thanks for sharing, I found this article while googling for music events, interesting comments and good points made. You bring up a good point with glucose issues. It is important to lay off the carrots and sweet fruits if anyone is prone to founder or Cushings. 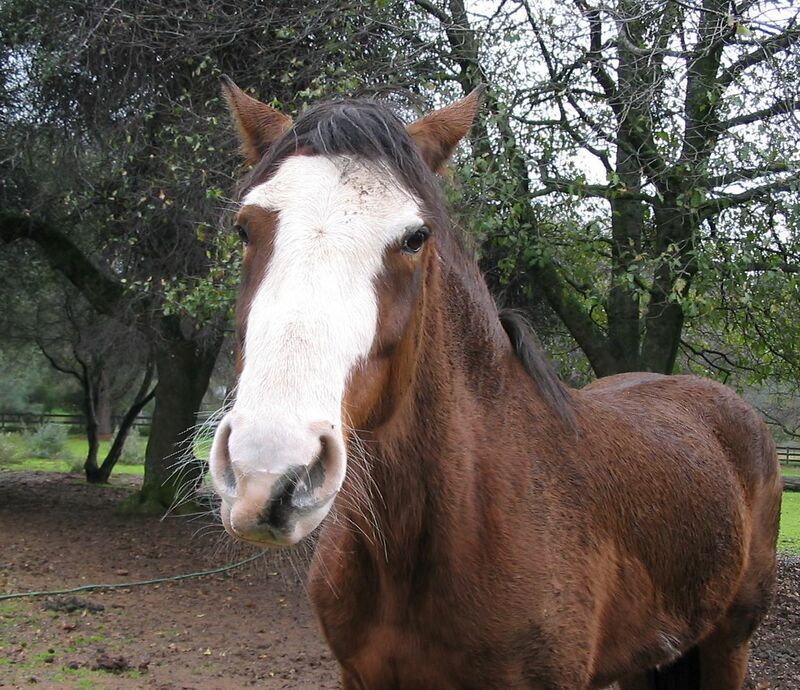 There was a very prolific pear tree on the property where I used to board one of my horses in the bay area and on our way back from a ride when it was heavy with fruit we would stop so he could have a treat. He would either pull one off himself or I would help him. And then there was always the ones that had fallen to the ground! He loved those pears. My mare, who has weight and probably glucose issues, gets a much smaller amount of carrots than the boys with her supplements, so I often give her several stalks of celery cut up in her bowl–never had any complaints, she scarfs them up. My pear loving boy, Simon, isn’t so sure about celery–he’ll eat a few pieces but when I first gave it to him he wouldn’t eat anything that had touched the celery!